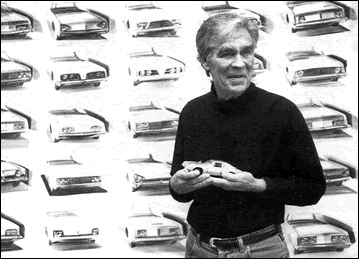 Tom Kellogg graduated from Art Center College of Design in 1955 after working for four months at Ford Advance Styling as part of the school program. 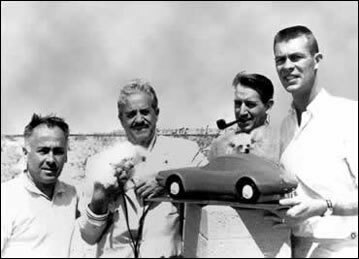 In 1961 he was approached by Raymond Loewy Associates to work on Studebaker's Avanti project. His contribution to the design of the Avanti was essential in achieving Loewy's objectives. Kellogg joined Loewy's New York office in 1962-63 and supervised the final design of the "Avanti-themed" standard Studebakers planned for 1964. In 1964 he opened his own industrial design office in Newport Beach. He designed motor homes, recreational vehicles and several lines of fiberglass boats. He was also involved in the interior design of the DC-10 for McDonnell Douglas. In 1972 he joined the industrial design and packaging firm of Gould & Associates as Vice President of Product Development. Shown above: drawing of a proposed Avanti two passenger coupe. Tom Kellogg with a collection of his designs.